This entry was posted in Uncategorized on February 25, 2015 by Peter Verhas. Junit is the Java unit testing framework. We use it for unit testing usually, but many times we use it to execute integration tests as well. The major difference is that unit tests test individual units, while integration tests test how the different classes work together. This way integration tests cover longer execution chain. This means that they may discover more errors than unit tests, but at the same time they usually run longer times and it is harder to locate the bug if a test fails. If you, as a developer are aware of these differences there is nothing wrong to use junit to execute non-unit tests. I have seen examples in production code when the junit framework was used to execute system tests, where the execution chain of the test included external service call over the network. Junit is just a tool, so still, if you are aware of the drawbacks there is nothing inherently wrong with it. However in the actual case the execution of the junit tests were executed in the normal maven test phase and once the external service went down the code failed to build. That is bad, clearly showing the developer creating the code was not aware of the big picture that includes the external services and the build process. After having all that said, let me tell you a different story and join the two threads later. Our programs have user interface, most of the time. The interface contains texts, usually in different languages. Usually in English and local language where the code is targeted. The text literals are usually externalized stored in “properties” files. Having multiple languages we have separate properties file for each language, each defining a literal text for an id. The problems came when we did not have some of the translations of the texts. The job of specifying the actual text of the labels in different languages does not belong to the programmers. Programmers are good speaking Java, C and other programming languages but are not really shining when it comes to natural languages. Most of us just do not speak all the languages needed. There are people who have the job to translate the text. Different people usually for different languages. Some of them work faster, others slower and the coding just could not wait for the translations to be ready. For the time till the final translation is available we use temporary strings. All temporary solutions become final. The temporary strings, which were just the English version got into the release. To avoid that we implemented a process. We opened a Jira issue for each translation. When the translation was ready it got attached to the issue. When it got edited into the properties file and committed to git the issue was closed. It was such a burden and overhead that programmers were slowed down by it and less disciplined programmers just did not follow the process. Generally it was a bad idea. We concluded that not having a translation into the properties files is not the real big issue. The issue is not knowing that it was missing and creating a release. So we needed a process to check the correctness of the properties files before release. Checking would have been cumbersome manually. We created junit tests that compared the different language files and checked that there is no key missing from one present in an other and that the values are not the same as the default English version. The junit test was to be executed each time when the project was to be released. Then we realized that some of the values are really the same as the English version so we started to use the letter ‘X’ at the first position in the language files to signal a label waiting for real translated value replacement. At this point somebody suggested that the junit test could be replaced by a simple ‘grep’. It was almost true, except we still wanted to discover missing keys and test running automatically during the release process. You can use junit to execute tasks that can be executed during the testing phase of build and/or release. The tasks should execute fast, since the execution time adds to the build/release cycle. because these going down may also render the build process fail. When something is not acceptable for the build use the junit api to signal failure. Do not just write warnings. Nobody reads warnings. This entry was posted in Uncategorized on February 18, 2015 by Peter Verhas. Before getting to the topic of the title let’s have a simple programming sample. On the programming task I will demonstrate some bad coding style and based on that it will be easier for me to explain why the same style is bad in unit tests. Well, now that I wrote this sentence this seems to be a obvious statement. Why something would be good in unit testing when this is not good in programming. One thing is that it is not always the way like that, and the other is that the same mistake may not be so obvious when we create unit tests. 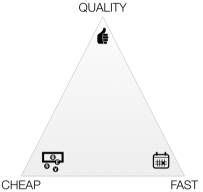 The demo task is very simple. 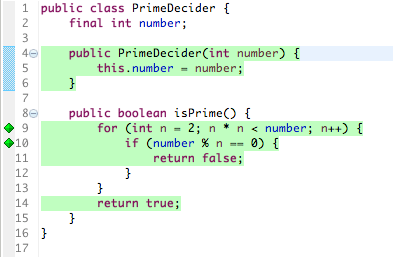 Let’s write a class to decide if an integer number > 1 is prime. The algorithm is simple. Check all the numbers starting with 2 until the square root of the number. If the number is not prime we will find a number that divides the number integer times, if we do not find a divisor then the number is prime. It is all green. There can go nothing wrong! We happy. correct answer for the numbers that are multiplications of three. For example it results true for an object that represents 9. Then comes the tedious work of bug fixing. What a joy it is usually. First of all you overcome your feeling that whispers into your ear that “the customer is stupid”. Obviously the customer is stupid because he wanted to use the class to test the number 9 it was never meant to be… hahh!!! and because the bug description is simply wrong. There is no method Prime! And the code correctly detects for example the number 3 (which is a multiplication of 3 itself) is prime. And it also detect correctly that 6 and 12 are not prime number. So how does a customer dare to craft such a bug report. Thoughts in your brain like that may help you calm down but do not help business, which is the first priority for a professional like you. In real production cases this may be a real and huge refactoring and if these special cases appear rarely since the code is usually used for numbers less than 25 then this fix is (may be) commercially OK. This is ugly, but it works. Real word code with god classes containing a few thousand lines do not get any better than this even after refactoring. Thats is not really meaningful, especially the last line. The bug was reported (in addition to some false statement) that the number 9 is not handled properly. But the actual bug was that the program did not handle properly the numbers that were squares of prime numbers. If you know ITIL the first one is the incident and the second one is the problem. We created a unit test for the incident and it was good we did that. It helped the debugging. But when we identified the problem, before applying the fix we did not create one to test the fix for the problem. This was not real TDD and because there was a unit test for the incident but we did not create it to test the fix. (with the appropriate camel casing in the method name) and it would have some square numbers, like 9, 25, 36 as test data. When fixing bug be careful with TDD. You may apply it wrong. TDD says to write the unit test before you code. The unit test you write will define what you want to code. This is not the unit test that demonstrate the bug. You can use that as a tool to debug and find the root cause. But that is not the part of TDD. When you know what to write, no matter how eager you are to fix the code: do write the unit test that will test the functionality that you are going to write. This is what I wanted to imply (in an attention catching way) in the title: write a unit test for the functionality or functionality change that fixes the bug instead of the bug. This entry was posted in Uncategorized on February 4, 2015 by Peter Verhas.